I understand all of the arguments for them. They are less messy. They are kinder to allergies. In a sense, they are a better investment than purchasing a new—and probably very expensive—one every season. Some say they are more environmentally friendly, although I will rebutt that later. They are artificial Christmas trees. The National Christmas Tree Association’s website said a little over eight million fake Christmas trees are sold every year, while roughly 27 million real trees are sold—a fact that I was more than happy to hear. As I get older and as friends of mine obtain their own apartments, I have noticed more and more people sporting artificial Christmas trees. And I understand, in a tiny, already-cramped apartment, a toddler-sized false tree does the trick. There are no pine needles lining the floor around your tree. These packed, plastic fabrications are available in a variety of colors—my roommates have even put up a white one and a pink one. While these two trees in my apartment make me feel a little more in the Christmas spirit, I simply do not feel the same elation that I do when I purchase a new tree—one that aromatizes the room with fresh pine. While I can understand many arguments for the latter, the proposition that fake trees are more environmentally friendly is one that I cannot support. While they are probably more economically viable in the long run, some experts believe that artificial trees really are not any more environmentally friendly than cutting down a real tree. In fact, Lori Brown’s article for Earth911 said that artificial trees can have a more negative impact. Because many false trees are made with PVC, they are non-recyclable—unlike real Christmas trees that can be recycled 100 percent of the time. 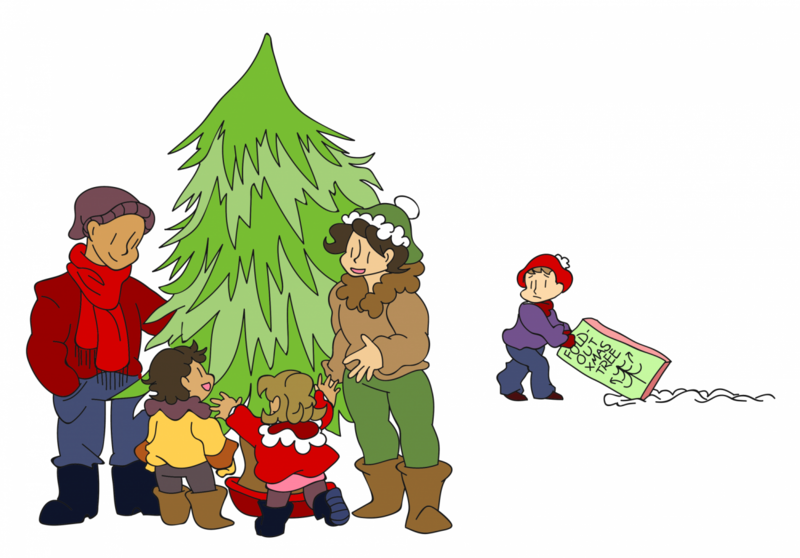 And as of 2010, there were over 4,000 recycling programs for real Christmas trees in the United States. Also, roughly 85 percent of artificial trees sold in the U.S. are imported from China, according to the National Christmas Tree Association. This further adds to their environmental footprint, as manufacturers are directly affected by melting and working with hazardous chemicals like PVC. On top of these harmful aspects, I just simply do not believe one can immerse his or herself in the familial, holiday experience with an artificial tree made from the same plastic my father uses to plumb houses. But perhaps I am biased. In my family, picking out a real tree is a tradition—my favorite tradition from any of the holidays. Every year, our clan of seven piles in the van and heads up to Home Depot—usually with a stop at Menard’s first, always holding out that maybe they will have a better selection that year. We saunter into the garden section, and if we are lucky, a light snowfall creates the perfect ambience. My younger siblings walk aimlessly around until they find what is usually the largest tree in the lot. My father—a large, burly man well over 6 feet tall—holds up the tree and twirls it around for the family. My mother and I, however, are the ultimate decision makers. The tree is the most important part of Christmas to us. We strategically note whether the tree is full enough and tall enough; we know that we love a Blue Spruce—if we’re lucky, we can find one with newly grown pine cones—and that we will never look at Douglas Fir again. Once we have been through the whole lot, and my mother and I use our meticulous eyes to find the right tree, we purchase the tree and the rope. My dad and my 10-year-old brother, who has to prove his manly strength, carry the tree to the car. It is cold, so five of our clan of seven pile back into the van. I make sure to bring my gloves every time now, and we stand outside strapping the tree to the roof. Then, we take it home and let it rest in the tree stand for a while as I put on a Santa hat and turn on the Michael Buble Christmas album. And that is an experience we would never get if we went in to Home Depot and purchased a boxed, chemically manufactured tree.